Barnsley’s finest THE HURRIERS tell Bob Oram what inspires their music. This article orginally appeared in The Morning Star. The band’s singer and lyric writer Tony — aka “Lefty” — is instantly recognisable as, in trademark hat, he saunters into Barnsley’s best pub, the Old No 7. He’s here to tell me about the May Day release of the band’s new album, From Acorns Mighty Oaks. If, like me, you’re bored with so much of the British music scene today, this record is a blast of fresh air. Wearing their hearts on their sleeves, The Hurriers deliver a roller-coaster ride of political venom, social commentary and spirit-lifting anthems. Lefty’s friendly and down to earth, yet his easy demeanour belies his fierce and passionate political convictions and commitment. We’re soon joined by the band’s rhythm section — his son Zak, who plays drums, and bassist Jez. A generational mix has given the band an energy and dynamic musical influences that, magpie-like, take bits from the past but then forge a sound of protest songs for the 21st century. The album, to be reviewed soon in the Morning Star, comprises 11 blistering tracks that cover everything from class consciousness and the need to keep fighting, NHS privatisation, parliamentary hypocrisy, the rise of the far right and austerity. The pride in their voices when talking about playing at the recent With Banners Held High celebration of the end of the strike is personal and pure. The band laugh when I ask if they think they can maintain a political message in every song. “Well, we started because I was so pissed off at a Unison conference in 2012 that nothing seemed to be happening,” Tony says. “I decided to form a band that would be proud to have a clear message in every song. So far, every gig we have done — bar one — has been a benefit. “We want to support our class and, yes, it is a surprise that it has taken this long in the face of this evil government for bands like us to appear. But there is a growing number of artists fighting back out there now. Sickened on the one hand by an unelected government carrying on what Thatcher started and yet on the other having no real alternative is a common gripe across the two generations in the band. Tony works in the NHS and says that the unions need to show some real leadership and literally get off their knees. “We need someone who we can believe in,” he says. “I cried that day when Bob Crow died, I don’t mind admitting it. That was a terrible loss. The trust he works for doesn’t want to leave the NHS and is being forced to give contracts to private companies. 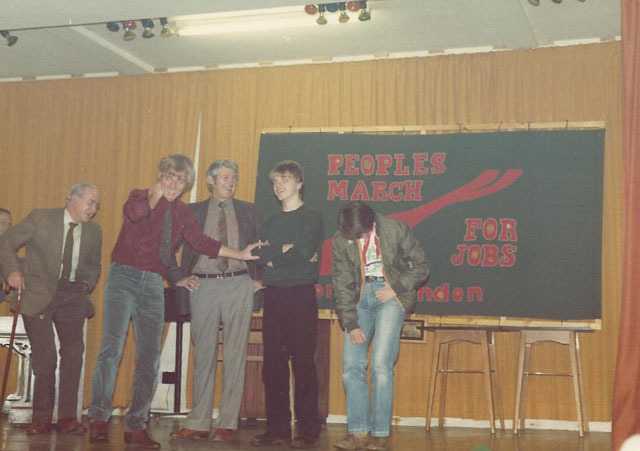 The band collectively praise the camaraderie and support they have received from others in the industry like Robb Johnson, Attila the Stockbroker, Thee Faction, Quiet Loner and Steve White and the Protest Family to name just a handful. 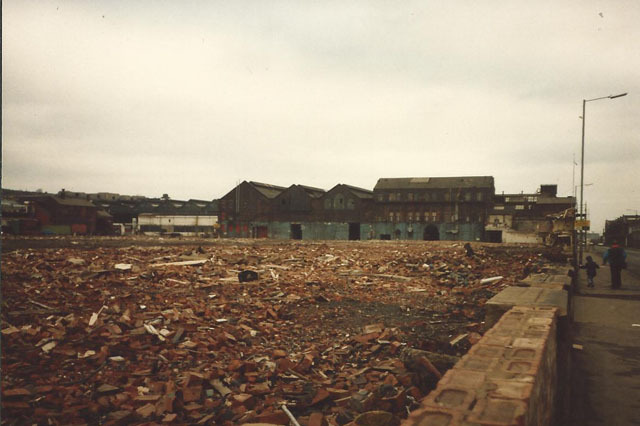 Building on the spirit of “don’t wait for someone else to do something for you,” he’s already booked Barnsley’s Civic Hall for a weekend “festival of defiance” over May Day weekend next year. The Hurriers are a great example of such a voice in a rapidly growing scene. Steeped in northern culture and history they make folk songs but with a sound so rich and thrilling it could easily cross over into the mainstream. Not since the 1990s has a band been so determined to chronicle the travails and ravages of their class and the defiant political stance in their lyrics tell a story that deserves the widest possible audience. 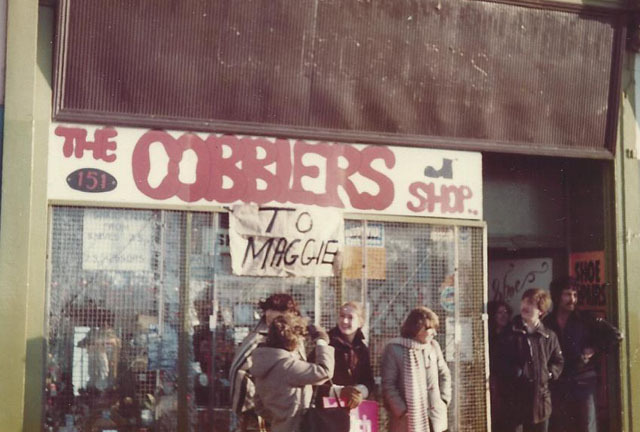 From Acorns Mighty Oaks is available from www.thehurriers.co.uk and independent record stores from Friday May 1. The album launch takes place on that day with a free-entry gig at Barnsley’s Underground venue, where the band will be joined by Jon Langford and His Men of Gwent, Quiet Loner and a DJ set by Barnsley Sime. Many thanks to all who turned up to our birthday party rally today. 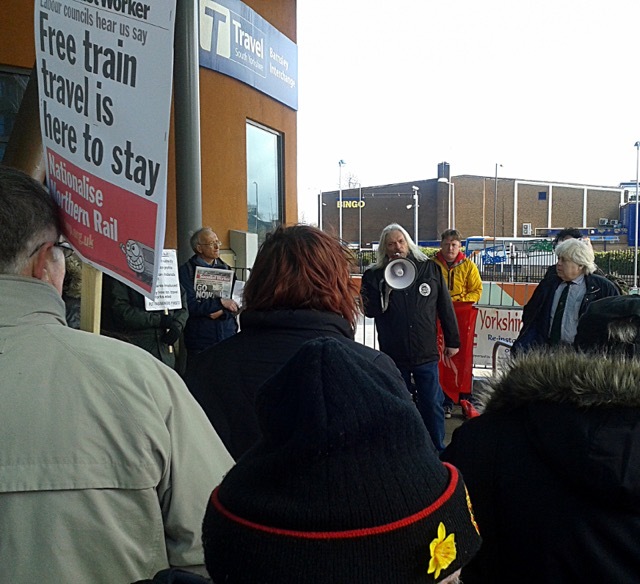 Well over 100 and lots of people sent their apologies for not being able to get along.Tosh McDonald, our old friend from train drivers’ union ASLEF, now National President, came along to bring us warm greetings and support again. 14 other speakers including from the Bakers Union and Unite Community spoke. We had birthday cake which we enjoyed greatly. Postcards supporting the campaign to take trains back into public ownership were distributed as well. We had arranged to give some out at Barnsley train station tomorrow as well but I do not have any cards left so that will not go ahead. There is no planning meeting this week because we could not get the room in the library. The next meeting will be Thursday April 16th at 11am Barnsley library. We had a really positive Freedom Riders meeting on Thursday. We have a huge number of leaflets advertising what we are doing and inviting people to our anniversary rally on March 31st. 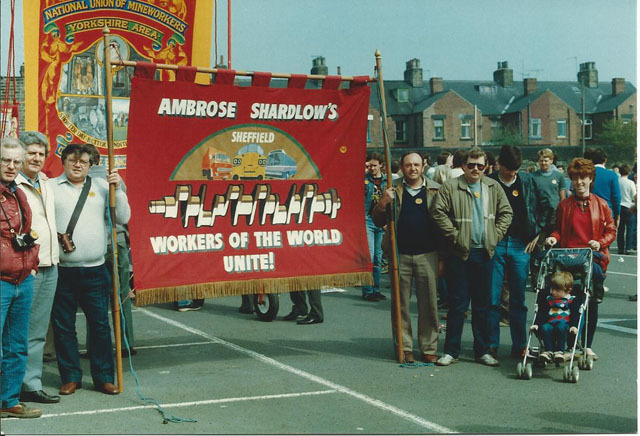 Dave announced at the meeting that our old friend Tosh McDonald (who is now National President of ASLEF) is coming along to that rally. We already have loads of leaflets that have been taken for leafleting clubs, bingo etc. We decided that we will organise leaflet distribution in Barnsley every day next week. We’ll see if any leaflets are left after that! Do pass on to friends, neighbours, family. We want to get as many new people along as we can and also as many of the original Freedom Riders as possible. We have done a tremendous amount in the last year and this should be a great chance for us to celebrate. If you just want to get leaflets to use round your area then come to the bus station at one of those times and you can have as many as you need. As you will know March 31st marks the anniversary of the first Freedom Ride. We intend having a celebratory rally and are inviting along people who have spoken at our rallies. I hope you are able to join us at Barnsley train station at 11am on Tuesday March 31st at our rally. Below are PDFs of the leaflet. Please pass on the information and invite to anyone else you think might want to join us. 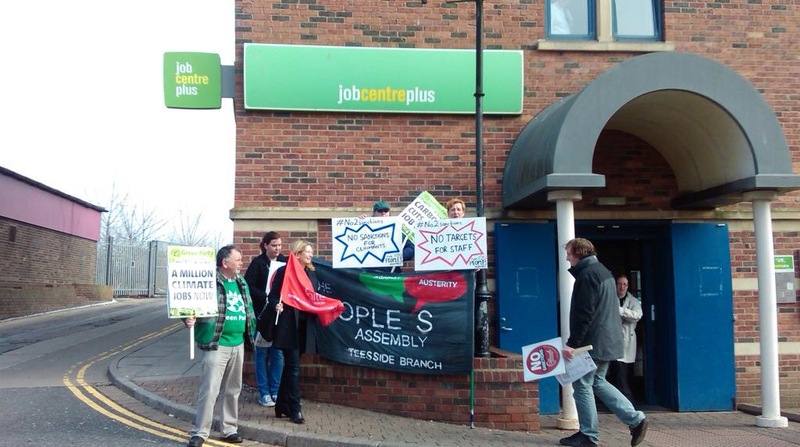 On Thursday 19 March demonstrations took place across the region against Benefit Sanctions. Below are photos and reports from a number of the demos. 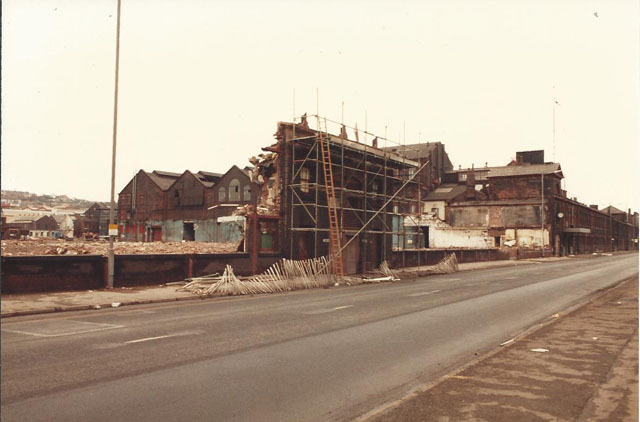 Photos from Barnsley, Hartlepool, Stockton and Leeds. Media story in Teeside Gazette Live. Good demo in Barnsley. 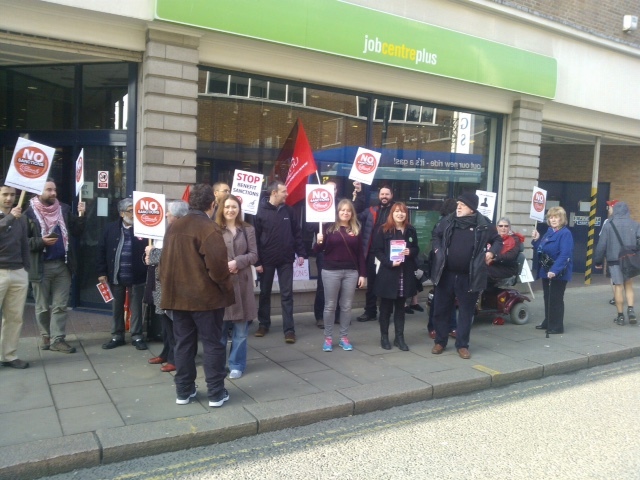 Almost 40 marched round town to Job Centre. 16 Freedom Riders came and joined in demonstration saying that they were opposed to cuts this Tory government is making against pensioners, unemployed and trade unionists.Lively rally outside job centre where a claimant who had been sanctioned came forward and described his experience and received applause for his courage in speaking out. 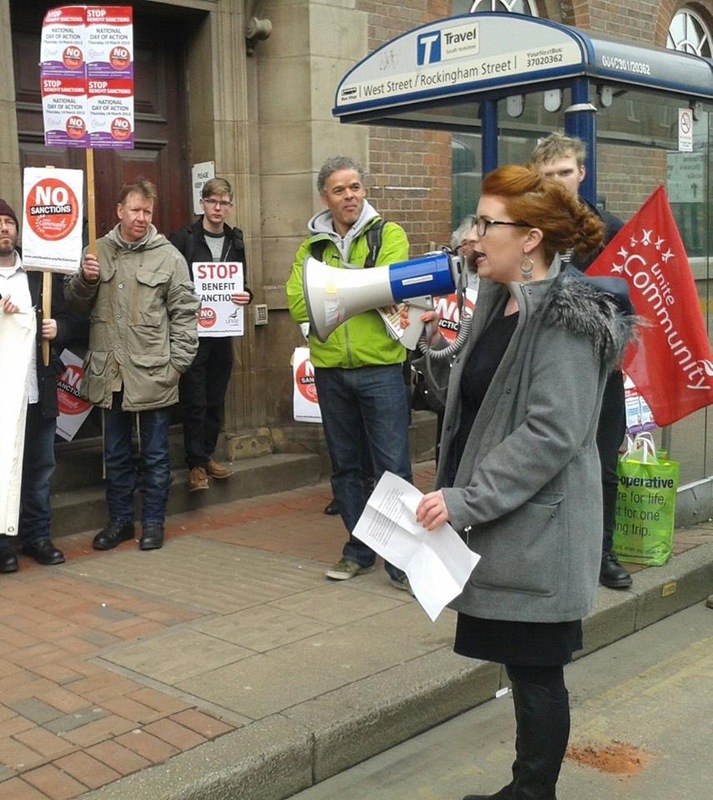 About 40 people attended a protest rally against benefit sanctions in the town centre today. 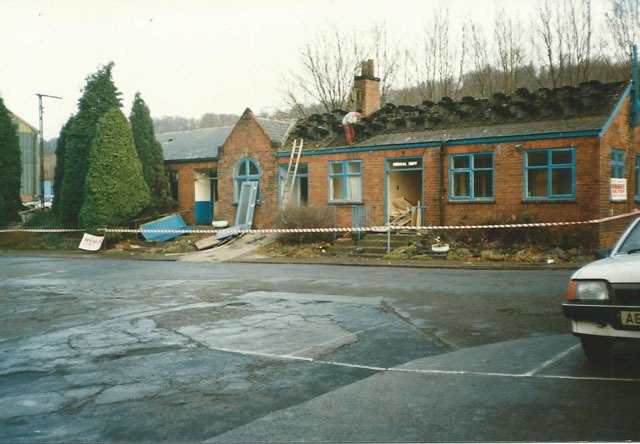 It was organised by the local Unite/Community Branch, which is for people who are unemployed in the community. 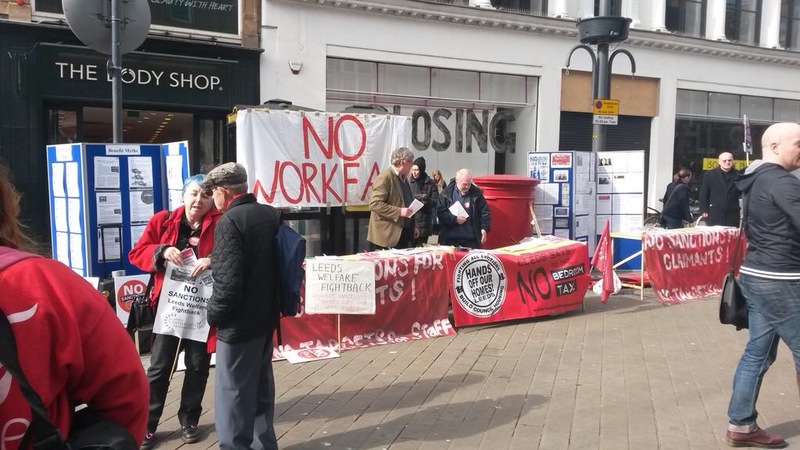 Our protest was one of 77 actions taking place throughout the country as part of a National Day of Action Against Benefit Sanctions organised by Unite /Community. 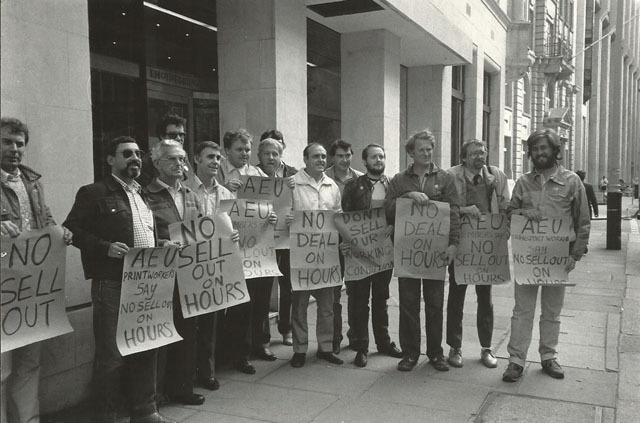 There were a range of speakers who all emphasised the punitive and arbritary nature of the sanctions against claimants that can result in them being without their benefits for anything from 4 weeks to 3 years. The speakers also stressed the need to keep up the campaign against benefit sanctions and all the other government attacks on welfare. Speakers included, Nick Ruff, Chair of Kirklees Unison, Jane East, prospective parliamentary candidate for Labour for the Colne Valley, Mike Forster, prospective parliamentary candidate for Trade Unionist and Socialist Coalition (TUSC) for the Huddersfield constituency. Speakers who are unemployed described their personal experiences. Karl Dallas, a member of Unite/Community, played his guitar and everyone joined in an anti-sanctions song that he had written especially for the occasion. Robin Bowles, on his accordian, added an uplifting feel to the whole event. 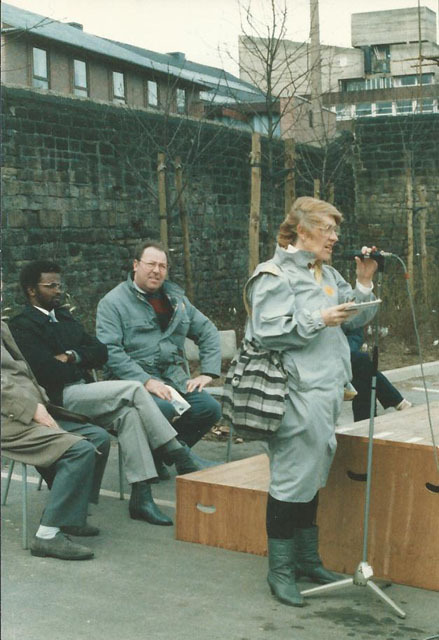 The rally was chaired by, June Jones, Chair of the Bradford, Halifax and Huddersfield Branch of Unite/Community. 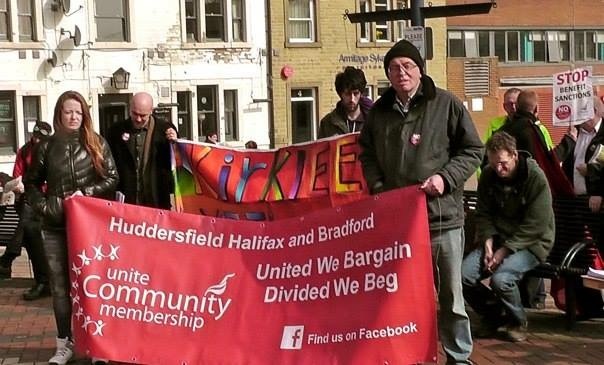 The next Unite/Community Branch meeting is on Tuesday 7 April at the Brian Jackson Centre from 11am to 1pm. We so far have six Sanctions Protests arranged in our region with the promise of more to follow. 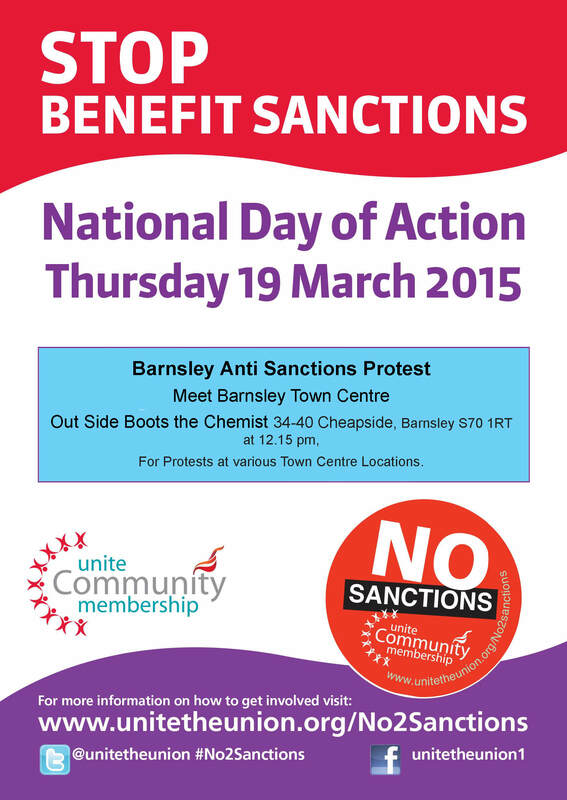 The NEY&H Region of Unite so far have six Anti-Sanctions Demonstrations planned, please see the leaflet below. Contact Claire.mawson@unitetheunion.org to order more leaflets or get in touch with joe.rollin@unitetheunion.org to find out how you can help make these demonstrations a success or to arrange your own. If you are planning your own demonstration on the day get in touch ASAP, the clock is ticking and we don’t want you to miss out on materials. Unite Community have already started to organise on a national level here is a link to our National Stop Sanctions Website. Our National Facebook Page here. And our # for the day is #No2Sanctions please remember to use this on all you Tweets. We also have created a Regional Webpage here. And Our Regional Community Centres are also hubs for information materials and action! Check Them Out!!! Another well attended and successful meeting on Thursday. We firmed up arrangements for going to York on Monday 2nd March to lobby Northern Rail. We already have almost 50 people going on the bus and hope to fill it. 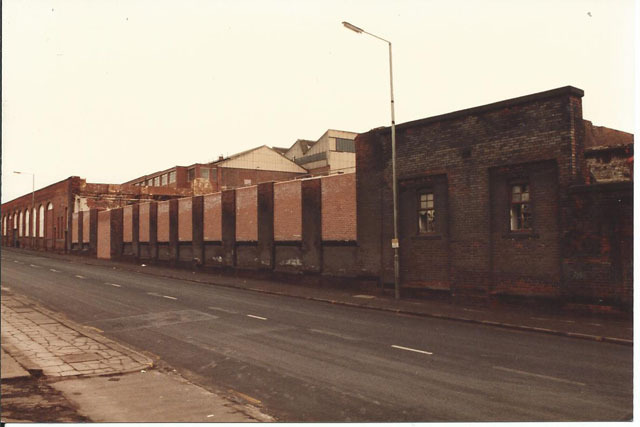 Sheffield 10am prompt Paternoster Row (road beside Showroom cinema). Barnsley 10.30am Eldon Street (opposite Parkway cinema) **** note: little earlier and different spot. Doncaster 11am front of railway station. We should get to York about 12 noon. We hope to arrange a march into York centre after the lobby possibly meeting up with a disabled people’s demonstration. 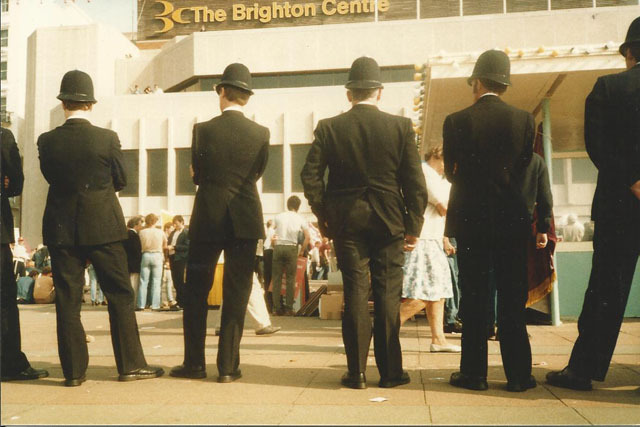 We are going to leave time for getting lunch – not sure what time to return but we want to miss teatime rush hour. If you haven’t put your name down yet then email or phone me to book a seat. We have decided to have a leafleting session Monday week, 16th Feb, at Barnsley bus station at 11am to advertise the York demo and advertise our campaign and then to catch a bus just after 12 to Barugh Green to lobby Tates Travel offices to get them to consider bringing in the flat £1 fare for any journeys outside of 9.30am to 11pm as a couple of companies are now offering. If you cannot stand for an hour leafleting then come along just before 12 to join the lobby of Tates. 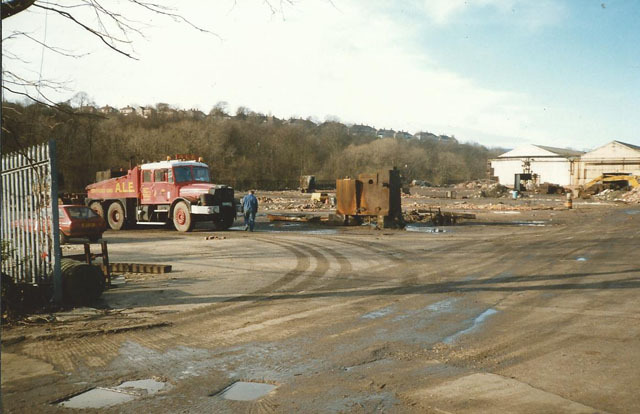 The next planning meeting in Barnsley library will be at 11am Thursday 19th February. 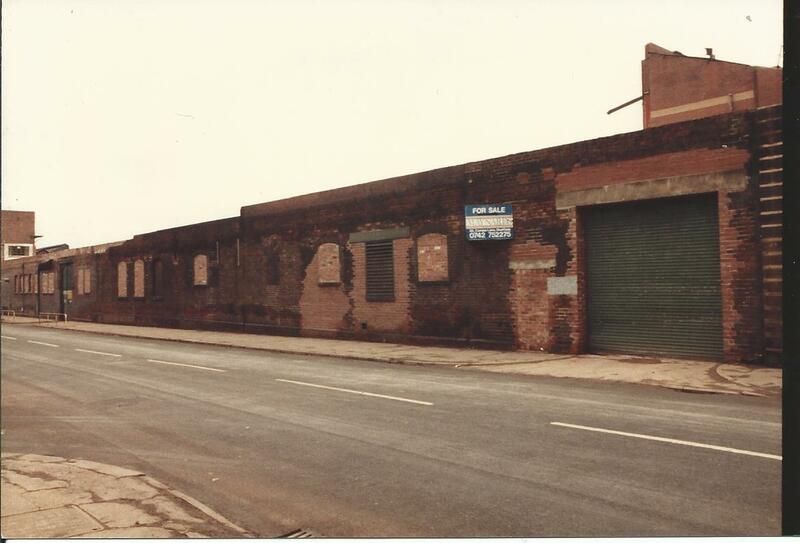 More images from the archives of Brian Clarke. 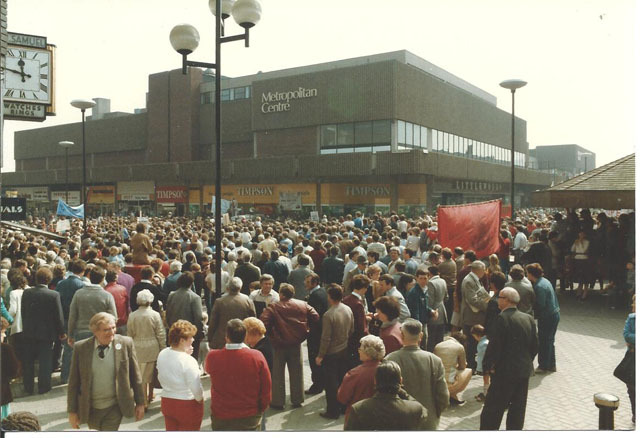 Barnsley Town Centre May Day 1984. Betty Heathfield speaking at an AA meeting in Barnsley, Norman West MEP waiting to speak. 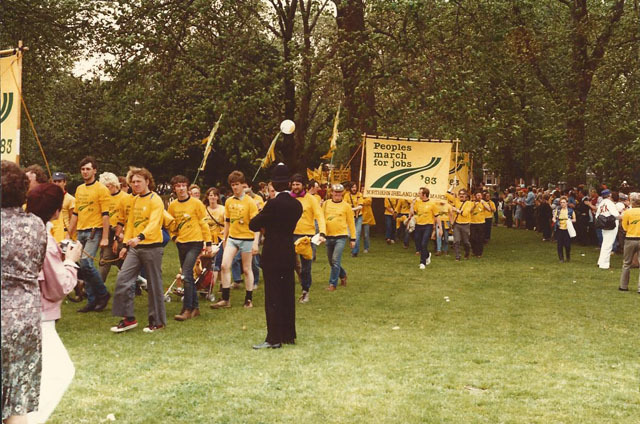 A March in Liverpool 1981. Peoples March for Jobs. 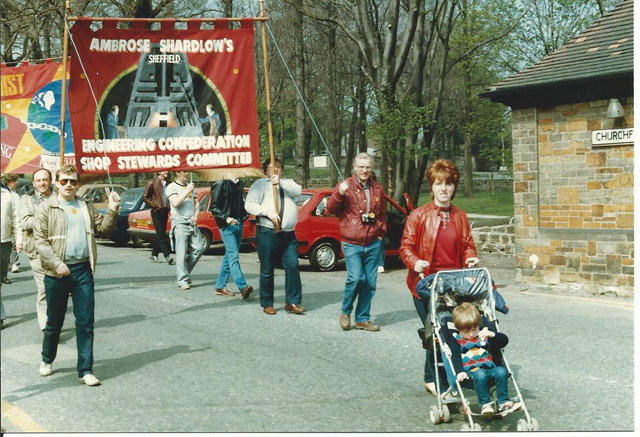 Marchers being welcomed at Wortley Hall 1982. We had a very successful lobby of Transport Committee yesterday and then marched down to Barnsley interchange to show support for cleaners and other staff facing redundancy. We are asking the Transport Committee to use some of its £12.2 million reserves to return our concessions and to oppose these cuts. 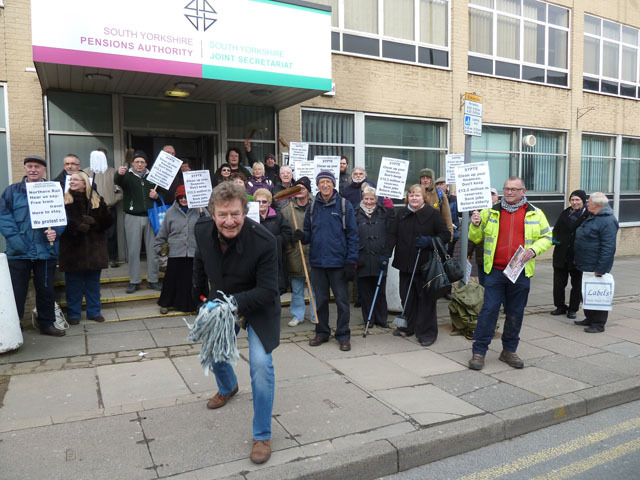 Attached is photo of our protest with Dave leading the ‘clean up your act’ with his mop. Hopefully there will be a story and similar photo in Chronicle this week. We have our next planning meeting this Thursday in Barnsley library at 11am. Anyone who is able to turn up earlier might want to support a lobby of the council meeting at Town Hall. 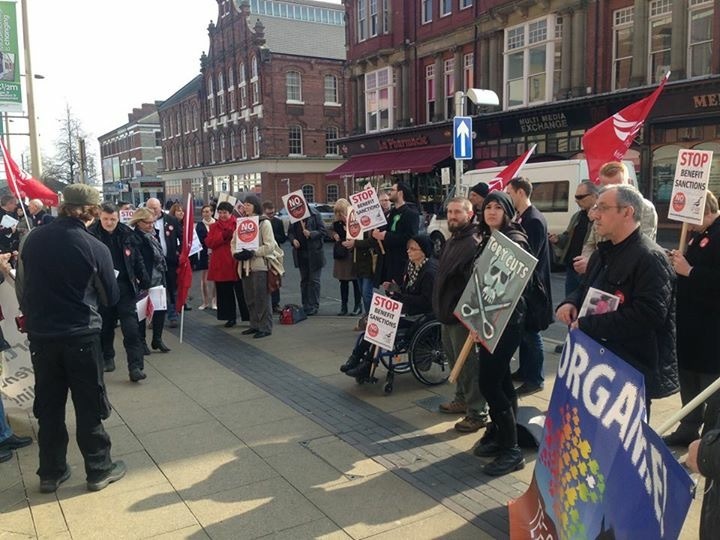 The campaign against Benefit Sanctions met last night and called a lobby of the council meeting from 9.30 to 10.30 am on Thursday to protest at council budget including the poorest in Barnsley being forced to pay higher council tax bills. We are getting quite a list of names to go to York on March 2nd for protest at Northern Rail headquarters. If you want to join this protest email back or let us know at Thursday’s meeting. 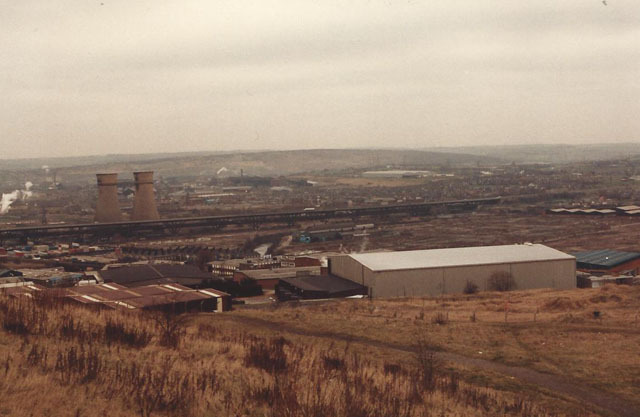 A historical look at the Trade Union Movement in South Yorkshire in the 1980’s, from Unite Community volunteer Brian Clarke’s archive. 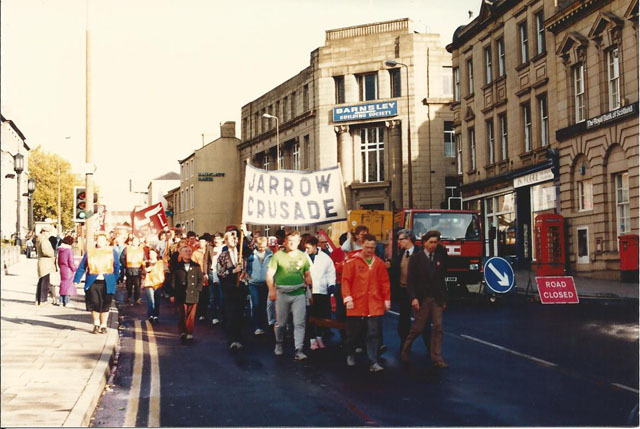 Image include the 1983 March for Jobs, the 1984 May Day March in Barnsley, the 1986 Jarrow March as it passed through Barnsley, AEU trade unionists and a few shots of Sheffield factories after they had closed. 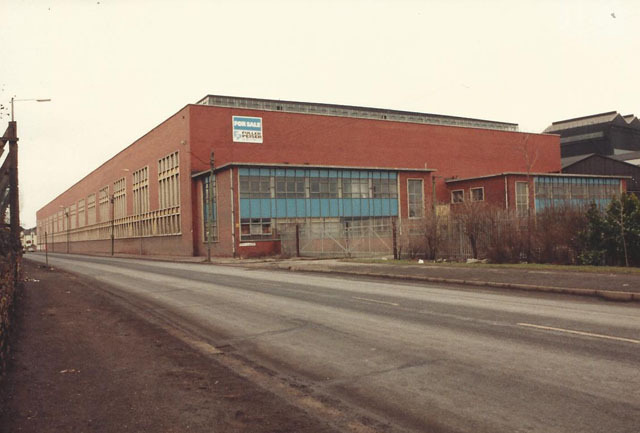 Including the AEI factory, Bone Craven, Firth Browns, Hadfields, Jessop Saville, River Don Works and Shardlows. We had a very large meeting again last Thursday to decide what we are doing this coming year. There was a very good discussion and the following activities have been arranged. Monday 26th January 11am: meet at Barnsley train station. 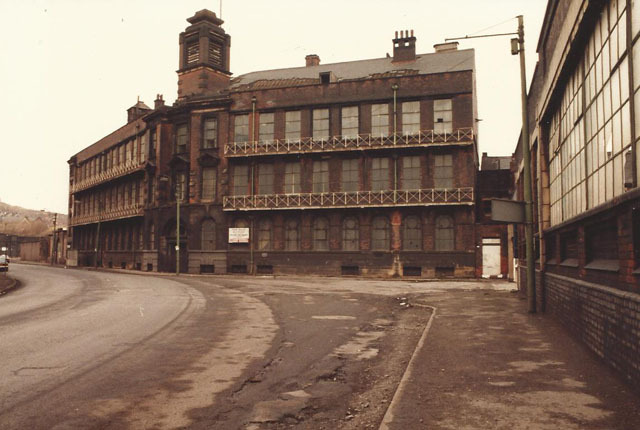 We will have a short rally there and then go round to Midland Street where Stagecoach have their offices. We are going to demand that they consider bringing in the same offer that TM Travel have introduced of a £1 fare between 9am and 9.30am and after 11pm. Monday 2nd February 1pm: lobby outside Transport Committee on Regent Street Barnsley. Their minutes show that they have reserves of £12.2 million pounds. This is 15% of their previous year’s spending! We are going to demand that they ‘clean up’ their budget by spending some of this on returning our concessions. Bring a brush or a broom if you can to show we are there to help with the ‘cleaning up’ of the budget. Following the lobby we will go down to the interchange to use our brushes and brooms to clean up the interchange to protest at jobs being cut which will reduce cleaning among other things. Thursday 5th February 11am: Next Freedom Ride planning meeting in Barnsley Library. We decided to hold meetings every two weeks so the next meeting after this will be 19th February. Monday 2nd March: Protest outside Northern Rail headquarters in York. We are going to hire a coach to take people there. We hope to pick up Sheffield, Barnsley, Doncaster getting to York about 11.45am. If you want to take part in this protest then let me know so I can book a seat for you.We also discussed arranging Freedom Rides again in the near future. A number of new ideas were put forward about how to organise these. There will be more discussion about how to do this at the rally at Barnsley station on 26th January. Other things happing: I have just been informed that Barnsley Council have decided to cut funding of the mobility shop between Alhambra and Holland and Barrett. This will have a devastating effect on many disabled and elderly people who use the mobility scooters to travel round town to do their shopping. It is an issue that we should take up. Any ideas welcome. Thursday 22nd January: the Yorkshire and Humber National Pensioners Convention quarterly meeting is taking place at Hillsborough Arena. Some people at Thursday’s meeting said that they were interested in going. The meeting starts at 11am. We will have a chance to report on Freedom Riders but most of the meeting will be dealing with other items of concern to pensioners. 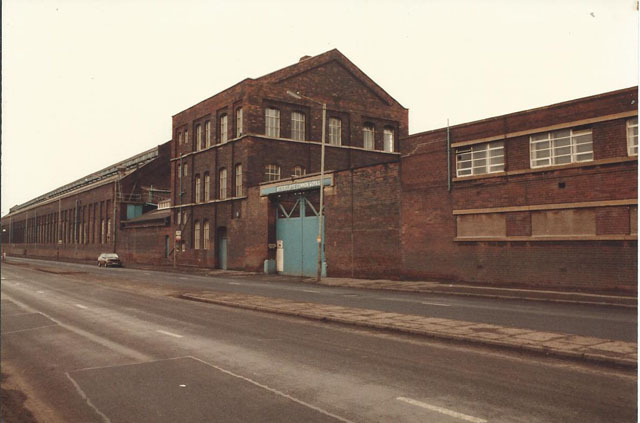 If you are intending going let me know and I’ll pass on details of how to find the venue which is 3 minutes walk from the Hillsborough Park tram stop. 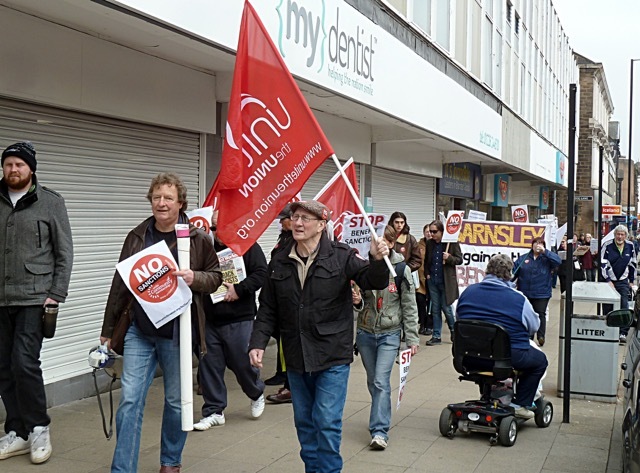 Thursday 29th January 2.30pm: Barnsley Retirees Action Group meeting Age UK offices bottom of Queens Road. We will be discussing how to fight back against other cuts being made to pensioners. Tuesday March 31st: will be exactly one year since our first Freedom Ride. 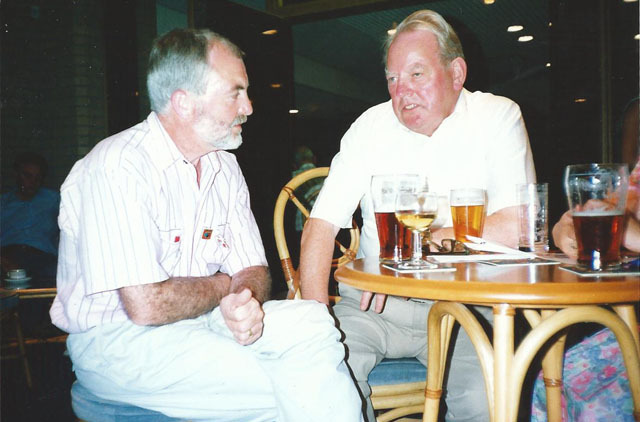 Do think about something exciting we can do to mark that anniversary.